In two weeks I will be fifty. Birthdays have always been difficult. Over fifty years, I’ve racked up a passel of dysfunctional celebrations that have worn grooves of negative comfortability in my life. Mindful gratitude is a good antidote. I have spent the past few weeks marking the occasion of my semi-centennial with a Facebook countdown and a regular posting of mementos. I have researched things about my family, taking advantage of how organizations are now digitizing collections of historical documents. This is the way to strengthen gratitude muscles and establish a different groove. It’s been an amazing year of growthfulness and change. I have reposted many of these mementos here. 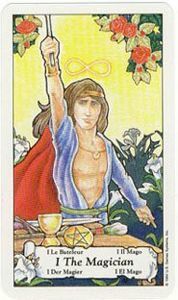 Perhaps the most curious indication of change can be found in my Tarot cards. I’m an avid Tarot fan. I’ve been using Tarot cards as a journaling device for 25+ years. Although I journal inconsistently, I journal with Taro most faithfully, and consequently I have something of a record to see a pattern in the cards. I always get swords. Swords and coins, followed by rods. I never get cups. Ever. I suppose there’s not enough data for MANOVAs, ANOVAs or other sorts of starry nova variates analyses to confirm my perceptions, but certainly the story should count the most for the probable truth. In the past year, swords have run amok in my readings, mostly in shapely faces of court cards, but frequently in cards indicating battle and binding. Conflict, challenge, and paralysis, the year of the paladin, lost or embattled, that has been my current state of affairs. It’s all so very draining with the demands of work, so life-sucking. And ego-centric too. Those lovely, double-edged swords tell a tale. A few weeks ago I started getting cups, cup after cup, an abundance of cups, filled with illusion, magic, emotion, and change. Cups and rods, I’m fair to bursting with them. Something’s clearly brewing and growing in my life to fill these cups with plenty. The question is plenty of what? The cards never lie. They fall where they do, as they do. That’s what every reader has always said. What I tell myself about them might be lies, but that’s perfectly fine because it makes for a great and mindful change in new directions. Here’s to another fifty years.